A young airman whose body was found 60 years after his fighter plane crashed during World War II has finally been buried with full military honours. 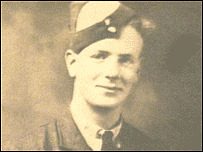 Sgt William Reidy, 20, from Boscombe, Bournemouth, was the navigator on a Mosquito fighter bomber which crashed into the Wash in March 1945. He had been on a training flight from RAF Swannington in Norfolk. The plane lay undiscovered until last year. He was buried with his five military medals at RAF Marham on Tuesday. The ceremony, at the Roman Catholic Church at RAF Marham, included airmen forming a guard of honour for Sgt Reidy's coffin and a lone bugler playing the last post. His younger sister Stella Arnold flew over from Zimbabwe to attend the funeral. She said when she heard the plane had been found last year all the grief for a long-lost brother returned. "It was as if I was hit in the heart all over again," she said. "It was almost more than I could bear, but I've got a wonderful husband and he came and took both my hands and he said 'let it go, let it out'." "I think I sobbed that day when they said they had found it more than any other time." The wreckage was spotted in April 2004 during a survey of a rarely-used shipping channel in King's Lynn harbour. A Ministry of Defence salvage team from Plymouth lifted the wreckage after it was located by a Royal Navy diving team from Portsmouth. The de Havilland Mosquito was on a training mission on 20 March when it crashed. 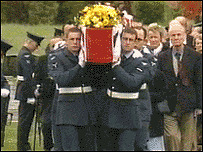 Pilot Flt Lt Gabriel Ellis also died in the crash. His family declined a military funeral service and laid him to rest two weeks ago at a private cremation.